Obama cranks up the heat on the frogs even more. It's that time of year again, when we search the political scene high and low to find something for which to be thankful. Need we point out that it's been fairly slim pickings for far too long? For every silver lining, there is always a dwarfing cloud. The Republicans took control of the House of Representatives in the 2010 midterm elections; what's that really accomplished? Now they have the Senate as well, but still don't seem to know how to use their power in any effective way. Every single new Republican Senator ran on a platform of "Stop Obama!" If ever there was a mandate for obstructionism, they've got it, but it remains to be seen whether they actually have the imagination and determination to do anything useful. Meanwhile Barack Obama runs roughshod over the Constitution, trashing the very idea of separation-of-powers and annihilating the concept of the rule of law. By waving his wand to "legalize" 5 million illegal aliens who have absolutely no right to be here, he's accomplished the seemingly impossible: done something so outrageous, so extreme, that even the loony lefties at Saturday Night Live couldn't help but ridicule him. And brilliantly so! Yes indeed, there is something to be thankful for this holiday season: hubris. As the saying goes, those whom the gods would destroy, they first make mad with pride. Consider the perverse brilliance and all-knowing ignorance of Obama's lawless immigration executive (dis)orders. For lo these many years it's been all conservatives could do to prevent our traitorous RINO representatives from signing on to Democrat-endorsed amnesty "comprehensive immigration bills." That would have been evil and un-American but perfectly Constitutional, and certainly irrevocable. If Mr. Obama had chosen to seriously push for an amnesty bill, and at least pretended to be nice, there's good odds he could have conned the gullible Republicans. But he didn't do that. Instead, he blatantly shoved a thumb in the eye of the American people. The Republicans may be the Stupid Party but even they eventually realize when they're being played the fool. No chance whatsoever of an amnesty bill passing the Schoolhouse Rock way anymore. That's something for which we can all be thankful. 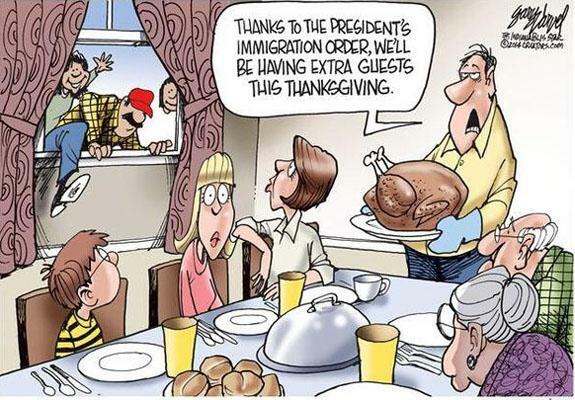 There's more, though, as this controversial cartoon briefly published by the IndyStar newspaper illustrates. Although the editor yanked the image from their website while acknowledging that deleting anything from the Internet is impossible, its truth is hard to hide. Yes, America, Mr. Obama's amnesty is doing exactly what's depicted here, down to the hue and sartorial choices of the invaders. Notice what's not being claimed: The three uninvited guests don't appear to have any evil intent. They don't come bearing AK-47s, baseball bats, or switchblades. Their clothes, while not the best, aren't wildly different from normal American styles, and certainly aren't alien burkas. Their faces bear friendly smiles, not covetous glances or threatening glares. This lines up with the experience most Americans have with the flood of illegal aliens: In the main, they are good people that are quite willing to work hard and earn their own way in life. For every intoxicated illegal repeat felon who murders a nun, there are a thousand others who'd no sooner do that than you or I. That's beside the point. The Latin Americans who swarm across our border in violation of our laws and sovereignty may well be decent human beings, and most of them in fact are. They are members of the human family and should be treated as such. But they are not members of our family and have no right to demand that status. For a long time now, the Left has counted on the natural sympathy of the American people for the needy as it pushes forward with its long-term project to replace inconveniently independent-minded and conservative Americans with more pliable, socialist, uneducated peasants from the Third World. With the recent appalling invasion of children across the border, and now with Mr. Obama's lawless amnesty in the teeth of a massive electoral landslide vote demanding the opposite, this sympathy is starting to break down. That dawning of reality is the cause for the most profound thankfulness of all. Whenever possible, Americans prefer to live their lives privately, in peace, and free of conflict with anyone else. 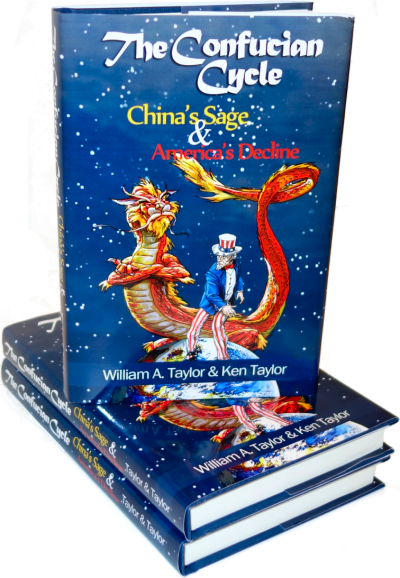 Once aroused to anger, though, as everyone from Imperial Japan to King George discovered to their cost, Americans become the most determined and thoroughgoing foe anyone could desire. By accident or by design, Barack Obama has been working double-overtime to arouse the fury and indignation of the American people. In the final analysis, this was dumber than anything the Stupid Party has ever done. The Left was winning! The Left has been winning for a hundred years! And final victory was in sight, as everybody "knows" and accepts that the 30 million Third World socialist illegals will never be deported and that we'll never stop many millions more from coming. If Mr. Obama had simply left things as they were, in 2040 or so the American people would be a minority in their own land, and the socialist Left could look forward to an indeterminately long future of governance. But no, Mr. Obama had to speed things up, and now America is waking up. What will be the end result? We can't say, but at least we won't go gently into that good night without a fight. Give thanks! "as everyone from Imperial Japan to King George discovered to their cost, Americans become the most determined and thoroughgoing foe anyone could desire"
I do not believe that that America (or those Americans) exist anymore. Yes, they exist here and there, individually, but that no longer represents "America" as nation. We are soft, stupid and satiated. We are Europe. And it wasn't Obama's doing. The tide turned long before he got into office. ....That's WHY he got into office. "If Mr. Obama had chosen to seriously push for an amnesty bill, and at least pretended to be nice, there's good odds he could have conned the gullible Republicans"
The American public overwhelmingly want proper immigration reform. A bipartisan immigration bill was passed by the Senate in 2013, approved by the President, the leader of the house refused to allow onto the ballot. The reforms passed by executive order are almost identical to the law signed by Reagan in 1985. Both Bush's also used executive order to pass immigration reform bills.